Some people think this has been the best World Cup for decades. I keep telling them how wrong they are. Martin Samuel has been informing us of the awful homophobia, racism, poor stadiums, fan fighting, the danger for supporters and of course the dreadful idea of FIFA holding this tournament in Russia. These people who think this is exciting and fabulous must be idiots, eh Mart? Ivor Point, England. Oh, Ivor, we all know who the idiot is. It’s the person who talks about the best World Cup in decades when the competition is less than a week old. And I have never speculated about poor stadiums or danger for supporters. The infrastructure was always going to be good because money would be no object, and I didn’t see violence as a problem because President Putin is not going to allow that in his back yard when he is trying to show his best side to the world. Racism – well, yes, Russia has that and every official report confirms it. Homophobia, too. And I do think it is a poor idea for FIFA, or any major sporting body, to indirectly endorse a regime that has indulged in systemic state-sponsored drug cheating on an industrial scale, and has corrupted at least two Olympic Games. Evgenia Pecherina, a discus thrower and whistle blower, estimated 99 per cent of Russia athletes were in the doping programme. But that doesn’t mean they can’t organise a tournament – just that they shouldn’t have got one. I was in France in 2016 when every time you needed to fly south, the pilots went on strike. That was never going to happen here. And it’s the best signage of any major tournament I have attended. All the media stuff – accreditation centre, press centre, press tribune, mixed zone – is in orange. So you arrive and look for the orange signs. So simple, so logical. The Bolsheviks knew about branding and image before the concept had even been popularly considered. Why do you think graphic designers still study Soviet iconography? So it’s been good, and I’m enjoying it, because I like tournaments in single countries – but let’s not kid ourselves. Major sporting events show a nation at its best. England, and London, was a completely different place in 2012 than it is now the carnival has left town. South Africa was crime-free for a month in 2010; favelas in Brazil suddenly got clean water in 2014. A look at all of those countries reveals marked change once the circus left town, and not for the better. I know a win is a win but England’s performance was lacklustre. I’m not a hater, I’m a supporter, and wish the team well, but I am frustrated at the potential that is within the squad not being realised. Obsidian Onslaught, Belfast. There was quite a lot of this after Tunisia, so I’ve got to say here and now that I disagree. I think many players are realising their potential under Gareth Southgate – in the first match, Jordan Henderson, Harry Kane and Kieran Trippier, to name three. We’re a young team, inexperienced, the starting XI hadn’t played together before and all that was missing was the finishing. The rest, I thought, went well bar the odd defensive error – which will happen when picking a back three for their football, as much as their resilience. Harry Kane was the laziest player on the pitch giving no help to Raheem Sterling whatsoever. Henderson was useless and fed one ball through to the attack. Dele Alli was more than useless as was Ashley Young who got one ball across to an England player and that from a corner. Yet it’s all Sterling’s fault. Curious Mind, Christchurch. No, it wasn’t all Sterling’s fault – but it certainly wasn’t the fault of the four other players you mentioned, who were all among England’s best performers. As a Liverpool fan I am very pleased to say Henderson was the best player on the pitch. No mistakes, good passing, and in the right spaces. Dejffjed, Prague. I agree. I made Henderson England’s man of the match. As a Chelsea fan I have to admit, through gritted teeth, that Trippier was by far the best player on the pitch. Gate13, Hereford. He had a very good game. I’ve been advocating him in that position for England for a while now. Even if Kyle Walker was removed from a central defensive role, I wouldn’t restore him to right wing-back ahead of Trippier. With his first time crosses and use of the dead ball, he has made the position his own. The problem with Walker is not simply that he is being played as a centre back. Any Tottenham fan will tell you that he was always defensively suspect even when played as a full back. He was prone to lapses in concentration, especially in terms of positional awareness, relying on his speed and strength to allow him to recover from errors of judgement and technique. Although he did improve under Mauricio Pochettino, he remained an athletic player rather than an intelligent or skillful one. It is too late for him to eliminate these shortcomings now, but perhaps they would be less exposed if he were confined to sprinting up and down the right touchline rather than getting lost in the central defensive areas. Moving him now, however, would disrupt the team considerably. Moosbrugger, Chichester. I think that’s all fair comment, Moos. I was never the greatest fan of Walker’s for England although I do feel he has improved defensively of late. Giving away the penalty was poor, although the fall was exaggerated, but I don’t see too many better options for England right now. I think Trippier is a better crosser of the ball, so I wouldn’t switch. That leaves right centre half as Walker’s only position, the way this team is set up. Nothing more I love in life than seeing an England team lose – in any sport. I bet the press and fans are touting them to win the World Cup now. Skinner87, Cape Town. Hardly. All of this arrogant England stuff is really the most tired old twaddle. I remember my first rugby Test in the southern hemisphere, against New Zealand in 2003. England had the best team in the world at that time, and regularly defeated the All Blacks, but the locals were still convinced they were going to win. I couldn’t believe the arrogance. The veterans in the press corps on that tour told me: wait until you get to South Africa. I trust you haven’t disappointed them by remaining dignified and modest these last two weeks? Of course not. When Englishmen were men they used to shake hands after scoring a goal. That absurd pile of bodies after Kane scored made them look ridiculous before the eyes of the world. Sir Alf Ramsey would have been appalled. They just scraped a win against a tiny country: I didn’t know Tunisia had a soccer team. Border Force, United Kingdom. So who do you think England played in their opening game of the 1998 World Cup? What makes England look ridiculous in the eyes of the world is small-minded twits who think a country like Tunisia do not play football. They are currently the 21st ranked FIFA nation, played their first official game against Algeria in 1957, have qualified for five World Cups, were the champion Arab nation in 1963 and champions of Africa in 2004. Border Force? Heaven help us, if you are the first Englishman a visitor meets. We’ll see how good Tunisia and Belgium are when they play their next match. I think we may be able to beat Panama by a larger margin than Belgium. A Belgium draw against Tunisia and a five goal win over Panama will set up the final game nicely.Chris, London. I think we’re a bit ahead of ourselves here, Chris. Let’s beat Panama and see how it goes. Sterling is quick and flashy, but lacks composure and finishing. You can’t afford that luxury at the World Cup. You must finish your chances. Marcus Rashford should start – he caused problems immediately. FL in Florida, Jacksonville. 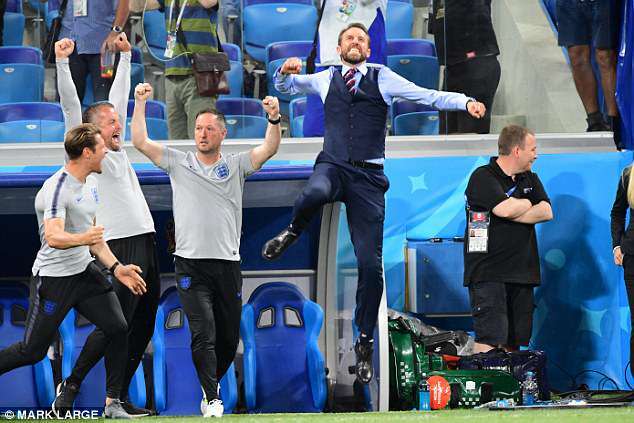 I would say Southgate is worried about destroying Sterling’s confidence, when he could get a goal and a boost against Panama, who look like the group’s weakest team. He cannot indulge him indefinitely, but another 90 minutes might make the difference. If England play like that against Belgium they will slaughter us. Lord Uhtred, United Kingdom. Really? We had more shots on target in the first half than any England side at a World Cup since 1966. If we play like that against Belgium they will struggle to contain us. Any team would. What we cannot do is fail to take our chances again. Rio Ferdinand was talking a lot of BS about positives. Results are what wins games. Sterling’s international record is two goals in 31 games. Some defenders have a better scoring rate. England should take note from German sides: you don’t produce you are out of the team. Yoyololo, London. Your argument regarding the primacy of results would have worked a lot better had England not beaten Tunisia and Germany not lost to Mexico, don’t you think? Portugal’s defence is solid and so is Spain’s. Their game ended 3-3 because it was fantastic and flowing, not boring like England against Tunisia. In the European Championship no one defended as good as Portugal and they have the same players at the World Cup. Let’s see what happens when England plays a proper team with this 3-5-2 system; Belgium are a lot better and faster. Joao Pedro Bento, Helsinki. I agree that Belgium appear to be better than England right now, but I’m not as convinced by the solidity of Portugal and Spain. I was at the game in Sochi and, as thrilling as it was, both defences looked vulnerable. I am not saying England’s defence is s better, just that I think all of those teams are stronger going forward. And while I accept Portugal kept it tight in the knockout stages at Euro 2016, they came third in their group which in any other year would have seen them go out. I can’t see any mention about Kane being pulled down twice. I thought the referees were going to keep an eye on this practice in the box. Anthony 1945, Cyprus. That’s my fault, Anthony. I didn’t see it as a big deal at the time, grappling goes on, sometimes it gets given, sometimes not. I also thought, having said Tunisia’s penalty was soft, it would look as if I wanted it all ways if I then started screaming that England should have been given a penalty for the same offence. As I’ve explained on here before, we write when the game is going on. Sometimes after the fact, when it’s all calmed down, you review an incident and think you might have misinterpreted it. With hindsight, I didn’t make as much fuss as I should about the fouls on Kane. I still can’t believe that everyone is getting so excited that we beat lowly Tunisia, with one sixth of our population. Robineff, Hampshire. It doesn’t work like that or China would be the greatest football nation in the world. Also, Tunisia have recruited heavily from France of late. Ruben Loftus Cheek? Tepee, London. Will start against Panama in place of the injured Dele Alli, I reckon. It’s great to start with a win but let’s face it we were only two minutes away from our usual dreadfully embarrassing draw. Much needs to improve if we are to make any mark in this tournament. Superhank, Rickmansworth. And yet you dominated the game and might have scored five. So it’s not as bad as you think. Enjoy a bit of sunlight mate. AEinstein, United States. The English fans will be blasted into reality soon enough. England will not win the World Cup. I would put my house on it. Martialunited2016, Norrköping. You’re not getting out of Norrkoping that easily, sunshine. I’ve just had a look. A cactus festival in Carl Johans Park? That’s the cultural highlight of the year? I come from London. I’m a member of the National Theatre. I go to gigs. Restaurants – I’m spoiled for choice. You can put your house on it, but even if we win the World Cup, I’m still not moving. I cannot understand why Southgate picks Sterling over Rashford. The minute Rashford came belatedly onto the field he injected a bit of vigour into a team that had started to flag. Hamishbeast, Manchester. Ever thought England might not have been the only team starting to flag, Hamish? I don’t think Roy Hodgson got everything right as England manager, but I agreed when he said we get obsessed with players who arrive late in games and look good when the opposition is beginning to tire. Sterling played against Tunisia at their freshest. Rashford after they had done close to 70 minutes on a very warm night. Good result for the BBC. Just read an article that they have 300 staff in Russia covering the World Cup at our expense. In the frame, Preston. So what do you want, a blank screen? You can watch every game at this tournament and that requires technical excellence, as well as a man with a microphone. Proper lads out last night. Refreshing change being a United fan whose club is infested by plastics. Bystrengthandguile, Poole. You come from Dorset. What United are you talking about? Blandford United? England did not deserve the win. In my eyes, Tunisia played better but were defeated by chance. Marco Diaz, United Kingdom. Vision Express: 08000 382 177. It was Tunisia. We should have battered them 4-0 or 5-0. How are people happy and enthusiastic about this result? Dano77, Spain. At the risk of bursting your rather insular bubble, no team has put five past Tunisia this century, and the last to score four was Cameroon in a World Cup qualifier on November 17, 2013. Since then, they have played Spain and Portugal in friendly games, plus good continental opponents such as Egypt, Morocco and Senegal regularly. Nobody scored four. What is it with England fans getting stuck into the national team all the time? You have a really good young squad and got three points in extra time from the first game. If it was Germany or Spain who won that way you would be saying that the champions always get a result no matter what. Timmychelseafc, Melbourne. Exactly. How often are we told that Germany find a way to win. This time it was England who did that. It doesn’t mean we’re going to lift the World Cup, but it’s still a good sign. Last-minute goal and here we go, it’s 1966 all over again. Calm down folks, we’ll be home soon, trophyless as usual. Hadenuff, Hull. I’m addressing the readers here. Don’t you think it’s ridiculous how many posters make points like this when nobody – nobody – talks in terms of 1966 or winning the trophy anymore? They project these cliches when all anyone has said was that it was a decent result, a good first-half performance and to win so late shows character. I got an email a week ago from the PR firm that represents Leeds Beckett University. 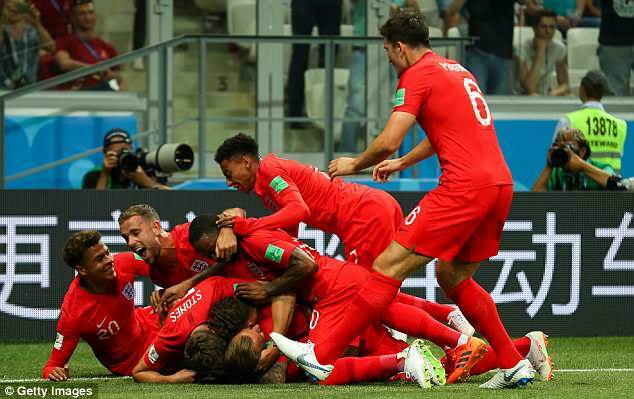 ‘Are high expectations damaging England’s chances in the World Cup?’ it asked, quoting research from their Carnegie School of Sport. Yet the argument is old hat. Expectations around England have completely changed. If anything, low expectations are more of a problem. We’re too pessimistic. If any of the big teams had dominated 45 minutes as England did on Monday we would have raved about them. It was one of the best spells of sustained pressure I have seen in the competition so far. We’ve got to reduce everything to 10 servants and one God. Kane did nothing but score two goals. I am very glad he did. He would not have scored either without a good corner delivered by Ashley Young or Trippier, however, or a towering header by John Stones or Harry Maguire. Not opinion but non-negotiable fact. No matter how hard Nike, FIFA and drone scribblers try to reduce football to one God and 10 servants, it is a team game. Stop infantilising football through this pathetic descent into groupie adoration. Rtj1211, London. Kane was the first England player to score two at a World Cup finals since Gary Lineker in 1990, so I think he received deserved praise not ‘groupie adoration’. I also read individual praise for Henderson, Trippier, Young, Maguire, Stones and Alli until injury intervened. The team serves the striker, who takes on the pressure and often gets the credit. That’s football and it always has been. Southgate is too much Mr Nice Guy. He should have been in the fourth official’s face demanding the referee look at the fowls in the box on Kane. British and Proud, Newcastle. Kane was beset by chickens? How did I miss that? Here come the idiots – ‘we’re going to win the World Cup’ after narrowly beating a non-League side. Nathan Marriott, Manchester. Actually it’s the opposite. Here come the idiots talking the result down, after England won their first World Cup game. Here come the idiots claiming everyone is banging on about winning the tournament when nobody now says that. Here comes the idiots with their relentless negativity, and their snobby, uninformed dismissal of England’s opponents. For the record, this ‘non-League team’ that England beat, contained players from clubs such as Gent, Montpelier, Nice and Leicester. Not the highest echelons, but far from amateurs. England were lucky to get away with that one. They played so badly, but blame the management. They knew what the weather was going be like and should have been there at least a week before the game to prepare for it. English teams in whatever the sport never prepare correctly for the conditions. Greg52, Lincoln. So instead of training in the familiar cool of Repino, your plan would be to adjourn to the flyblown heat of Volgograd, to be beset by midges and train in 80 degree temperatures for at least a week. What good would that do? It was a night match, anyway, and even those born into it in southern Russia complain about the heat and flies. England could have trained in Volgograd for a month and it still would have felt uncomfortable. They spent as little time there as possible, and won. They got it right. Viscount Hailsham and Dominic Grieve are demanding that the result be overturned as the Tunisians did not understand what was happening. AR1, Crawley. I certainly don’t understand what is happening. We won. Beat Panama and, in all likelihood, we’re through. The last time, after two games, we were out. What’s not to like? Certainly not this. Introducing, all the way from Russia, Zombie – the world’s coolest bass player. Until next time.